About 67% of all shopping carts are abandoned. In other words, 67 out of 100 potential customers leave your online store without completing their purchase. There are many possible reasons why a shopping cart is abandoned – emotional, practical reasons or total cost of purchase. It is therefore very important that you have a strategy for capturing abandoned shopping carts. By setting up smart, automated reminders, you can increase the closing frequency and conversion. 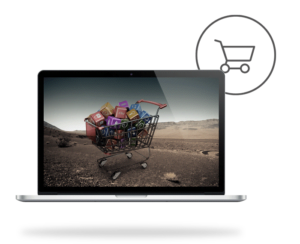 Cart abandonment is a term associated with e-commerce. This refers to when a customer has products or services in his virtual shopping cart but does not complete the actual purchase. Email is the best way to reach the customer while visiting the webshop freshly in memory. Include pictures of the products that are left in the shopping cart and have a clear link back. Feel free to have a time-limited offer eg free shipping. Also, tell us about your amazing customer service, fast delivery and purchase terms. As usual, you must test yourself to what frequency and content that works best for your particular recipients. Below are some of the most common reasons why a shopping cart is abandoned. This is the easiest email you can send. Just remind the consumer that the item they were looking at is still available in the warehouse. Attach images, price and make it clear that the consumer can still buy the item. Just remind you of the product the customer has abandoned. It is quite possible that the customer simply needs some time to decide on the purchase. Many consumers do not count taxes or shipping costs when shopping in a webshop. Therefore, the primary reason for abandoned shopping cart is that the consumer is experiencing the sum as being too expensive. Therefore, a good alternative may be to offer the consumer a discount if the order is made within a limited period of time. Send a simple message telling you what the customer has given up. List the products in the shopping cart and send a very clear link back to the webshop. Make sure the customer does not need to sign up again but only need to pay to complete the purchase. Make it easy for the customer to resume the order. Send a much more welcome mail. An eye-catching subject line, good content and above all pictures is important. Cart abandonment mail can be a good channel for further marketing. Encourage the customer to purchase by ensuring that you reserve the goods in the cart for a certain period of time. If the customer is assured that the goods are reserved, it may encourage completion of the purchase. If you want to find out why the customer does not complete the purchase, it may be important to ask her directly. By attaching a link with a quick survey, you can get valuable input. In this way you can also demonstrate that you are committed to understanding your customers’ behavior. Offer the customer high level of service by asking if there were any issues in the buying process or if there is anything you can help. Attach contact details along with details about the abandoned shopping cart.